Learn to play the pentatonic scales in the open position. Open pentatonic scales are good to learn if you’re practicing on an acoustic guitar. 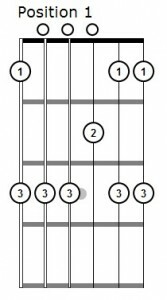 If you’re practicing your scales in the different keys, there’s often one scale that falls at the twelfth fret or higher. 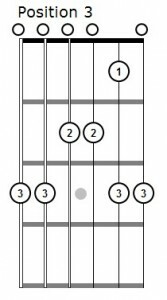 Since most acoustic guitars are built with the neck meeting the body at the fourteenth fret, it’s difficult to play scales at the twelfth fret or higher. If you learn how to play them in the open position, you’ll be able to practice all five scales in most of the keys. Also, there are a lot of songs and guitar solos where pentatonic scales are played in the open position. The intro to Wish You Were Here by Pink Floyd uses an open minor pentatonic scale, as does part of the main riff to Back In Black by AC/DC. 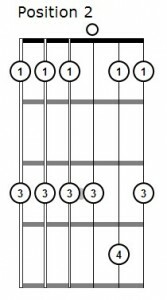 A lot of famous rock guitar riffs use the minor pentatonic scale in the open position with hammer-ons and pull-offs, so you should practice doing that scale with those techniques. 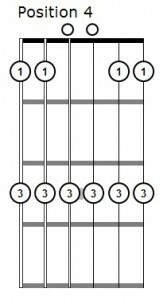 The easiest one to do is the minor pentatonic scale, and that one can be played two ways; see the diagrams below for the two variations. 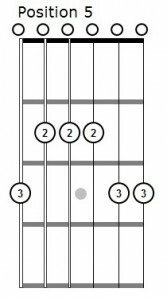 The variation using the first and second fingers tends to get used when done with songs where the guitarist is switching between strumming a G chord and then playing riffs. The second version is used when string bending is being done on the first, second or third string. Once you’ve mastered both versions, try out the other positions. Notice that you’re not using your fourth finger for any of the scales except for one note in the position 2 scale. That’s because you’re playing open strings where you would have been using your first finger, so all the patterns you play up the neck get shifted down one “finger” so to speak.